The reindeer had let him down: after too much Christmas spirit tasting they were donnered and blitzened. 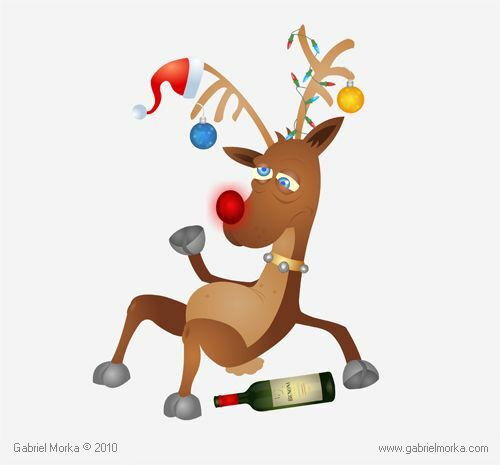 It’s why Rudolph’s nose is red – like Alex Ferguson’s. He only worked one night a year: this could get him sacked! Without reindeer he was going to have to charter loads of flights. He managed to make bookings, and after taking the park’n’ride (200 miles away from the airport) his CheapoAir flight awaited. Brilliant Clive. You had me giggling. Glad you enjoyed it, Brigid. As you know, I don’t have any pretensions towards being a creative writer but doing a little piece like this made me appreciate the skill of those who are: so many revisions and word changes! It looks to me like you are a very creative writer Clive. That’s very kind of you, Brigid, you flatter me!